The first year of my study at the academy, the mass of information on the artworld was overwhelming. So many artists; an absurd amount of artworks. As the artworld seems to have a well-developed system for exclusion and most artists have their not shown nor sold production at stock, the necessity of a recycling system seemed to be appropriate. 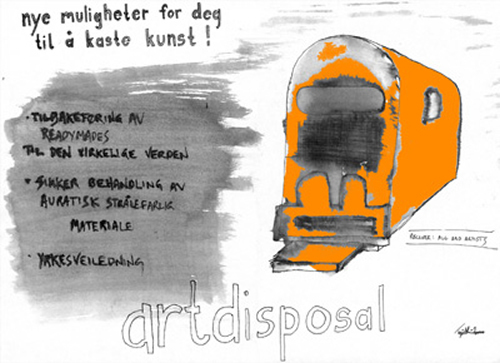 Not only would an art-disposal possibility relieve the artists from the overload neurosis that unexposed artwork generates, the artworld and the world as such, would be cleansed of untransported intentions that is known to create aggression. But why can't one just throw the artworks at normal recycling stations? Why this entire array? If we agree that artwork has an aura, the stocking together of different artworks from different artists would create an uncontrollable auratic radiation, a potentially dangerous situation. A chaotic flow of various intentions and expressions could lead to unintentional effects. So, the best way to treat the bad art is to throw it in specially designed containers made for this purpose. The symbolic power in the act of throwing art in these containers would refill the artist with confidence and leave his or her practice open for development and progress. Besides, why not put ready-mades back into their original function, such as pissoires, Hoovers and so forth.